The Olive is pleased to present the Write 399 Poetry Master Class from the University of Alberta. This month’s reading showcases the talents of Elena Belyea, Kayleigh Cline, Wendy McGrath, Mikael Raheem, Brendan Thompson and Kara Billey Thordarson. 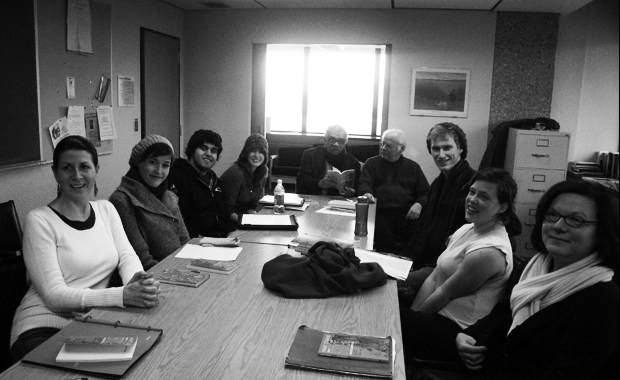 Keeping with tradition, we will welcome the Write 399 class from the University of Alberta for this month’s reading! Hope to see you there. Join us for the last Olive Reading of the 2009/10 season. It will be a spectacular grande finale hosting no less than 16 poets! The poets of Write 399 have spent the winter months conceptualizing, sampling, allegorizing, and shamelessly appropriating under the guidance of Christine Stewart. Now they are ready to showcase their conceptual works to the world. Prepare for a night of baroque, constraints, and possibly failure. Write 399 are: Zach Polis, Mikael Raheem, Chris Michaud, Conor Kerr, Jessica Whitney, Daniel McFadden, Virginia Dowdell, Hannah Madsen, Braeden Wright, Andrew Merrell, Jason Treit, Erika Anderson, Alessandra Loro, Hedda Hakvåg, Elena Belyea, and Wendy McGrath.